Soldier; born at Finale, Modena, 1795; died at Toulouse, France, April 5, 1858. At the age of seventeen he was enrolled as a volunteer in the militia of the kingdom of Italy. On the downfall of Napoleon he returned to his home; but in 1817, owing to a dispute between him and a local policeman, he was obliged to leave the country. He went first to Triest, and then to Constantinople, where he was for a time a ship-broker. Learning that Persia was seeking the services of European soldiers, he obtained an officer's commission, and helped to instruct the forces of the shah in European methods of warfare. He soon attained the rank of colonel. On the death of the shah in 1822, Ventura offered his services to his successor, 'Abbas Mirza. In the latter's service, however, were a number of English officers who were decidedly hostile to the French, with whom they classed Ventura on account of his having fought under Napoleon; and through their intrigues Ventura was dismissed. He then went to Lahore, India, accepting service in the army of Ranjit Sinh. A rebellion having arisen in Afghanistan, Ventura conducted successfully several campaigns of a difficult nature, and greatly enlarged the boundaries of the kingdom of Lahore. Ventura married an Indian princess, by whom he had a daughter; but he was always desirous of returning to his native country. 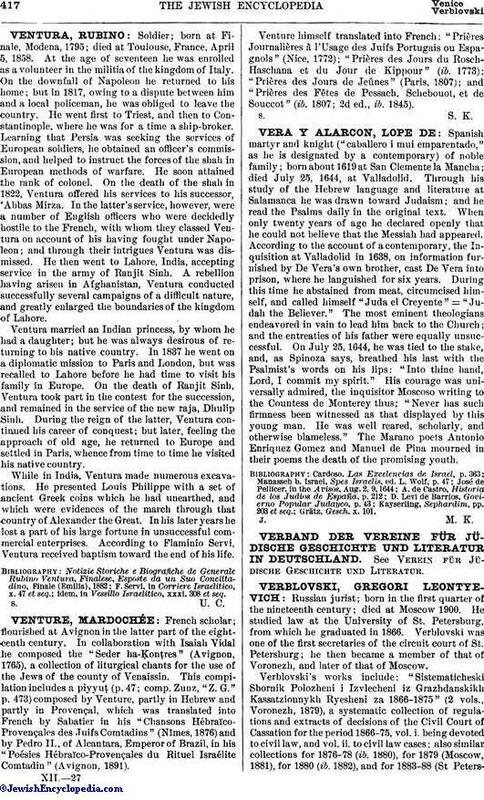 In 1837 he went on a diplomatic mission to Paris and London, but was recalled to Lahore before he had time to visit his family in Europe. On the death of Ranjit Sinh, Ventura took part in the contest for the succession, and remained in the service of the new raja, Dhulip Sinh. During the reign of the latter, Ventura continued his career of conquest; but later, feeling the approach of old age, he returned to Europe and settled in Paris, whence from time to time he visited his native country. While in India, Ventura made numerous excavations. He presented Louis Philippe with a set of ancient Greek coins which he had unearthed, and which were evidences of the march through that country of Alexander the Great. In his later years he lost a part of his large fortune in unsuccessful commercial enterprises. According to Flaminio Servi, Ventura received baptism toward the end of his life. idem, in Vessillo Israelitico, xxxi. 308 et seq.